What starts with slight redness and itchiness can often quickly become a major issue. Irritated areas of skin that struggle to improve on their own require special care and attention. 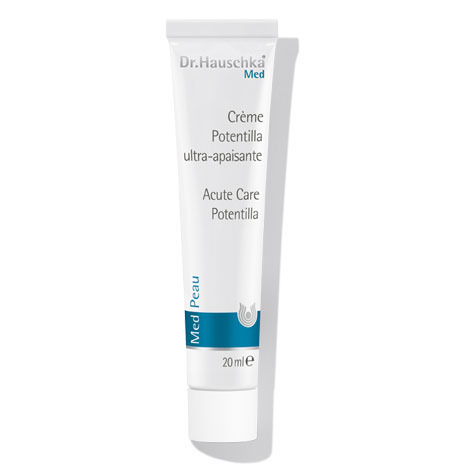 Acute Care Potentilla restores the balance to irritated skin. Thanks to the soothing and anti-inflammatory properties of tormentil (Potentila officinalis), it helps helps to sustainably break the cycle of itchiness and scratching. Itchiness is quickly alleviated – even at the first signs of reddened skin. Acute Care Potentilla can therefore be a good alternative for optimally caring for the skin. Apply thinly to the affected areas of skin several times a day as required. Allow to absorb fully to avoid discolouration of clothing. Once the skin’s condition has improved, Intensive Ice Plant Cream can sustainably stabilise it.